Each individual has an innate, natural balance or makeup of humors and qualities that is unique and personal to him or her. This is called an individual's constitutional nature and temperament. In Greek Medicine, to be healthy means to be totally in balance or in tune with one's constitutional nature and temperament. This condition is called being in temperament. Conversely, the further one strays from this harmonious, balanced state of being in temperament, the more out of balance and unhealthy one becomes. This state of being out of balance with one's innate constitutional nature is called a dystemperament. In Greek Medicine, the physician's job is to lead the patient back from a state of imbalance, or dystemperament, to one of balance, or being in temperament. The usual procedure is to start with the most recently acquired symptoms and conditions and backtrack to the oldest and most chronic, like peeling off the layers of an onion. It is possible to give some general standards of health, but they must be broad and flexible enough to include everyone. But when it comes to the particulars of exactly what constitutes perfect health for any given individual, it must be defined according to his/her individual constitutional nature and temperament. We all have our own unique capabilities, strengths, and weaknesses, and an individual mission and purpose. Just from obvious characteristics of physique and build, we can easily tell that not everyone was born with the potential to be a great athlete, for example. But it is possible for each person to find a state of health and balance in body, mind and spirit, by living and being in tune with one's individual constitutional nature and temperament. 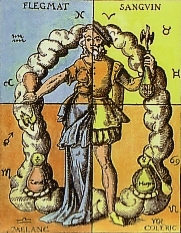 The Four Temperaments are the basic constitutional types of Greek Medicine. In addition to these pure types, there are also mixed temperaments. Actually, pure types are relatively rare; the vast majority of us are of mixed temperament. The usual pattern is to be of dual temperament, with one that's strongest or primary and another secondary temperament of lesser strength. Sometimes these two temperaments will be fairly evenly balanced, or shift back and forth in their relative dominance in response to various factors and influences - dietary, lifestyle, climactic and so on. A few people might have three dominant temperaments of roughly equal strength. Then, the distinguishing feature isn't the three relatively strong temperaments, but the one remaining weak one. Like a four-legged table with one short leg, the weak temperament must constantly be strengthened and supplemented. To recapitulate, there are four basic possibilities for individual constitutional temperament according to Greek Medicine: simple temperament; dual temperament - primary and secondary; dual temperament - roughly equal; and triple temperament, with the remaining one weak. To assess your individual constitutional nature and temperament, take a blank sheet of paper. On the left hand side, from top to bottom, list all the categories of traits used to describe the Four Temperaments. Then, across the top from left to right, put the headings of four different columns: S for Sanguine, C for Choleric, M for Melancholic, and P for Phlegmatic. Then, go through each of the categories to determine where you stand on each. If, for example, your nose and basic facial shape are Phlegmatic but your eyes and lips are of the Sanguine type, you would check both the P and S columns under Face. If your face is clearly of a pure single type, you would only have to check one column under Face. The same general procedure should be followed for each category. The most important traits for you to consider from a health and medical perspective aren't those concerned with mere surface appearances, but rather the deep and fundamental characteristics of physiology and metabolism, psychology and behavior. To be sure you get the right understanding and perspective, especially on these deep and fundamental points, it helps to go over this checklist with a good friend who knows you well. In tallying up the results, you may find that you've checked off items in multiple columns, or even in all four. However, you will find definite patterns of dominance and emphasis emerging. What if you're Sanguine in your facial features, but Melancholic in your appetite and digestion, and Phlegmatic in your sleep patterns? Don't worry - this "crazy quilt" pattern is actually quite common. Most of us are indeed a mixed bag. In Greek Medicine, knowing your individual constitutional nature and temperament is the most important first step on the path of health and healing. By knowing your individual temperament, you then know how to eat, exercise, sleep, rest, live and medicate yourself for optimum health maintenance and disease prevention. For the physician, knowing the patient's individual temperament means treating the person and not just treating the disease.